Reverend and Mrs. Milton Brown Umsted were born within two miles of each other in Gibson County, Tennessee. They grew up on adjoining farms, with only a few feet between their homes. They were children together, went to the same school, and sat in the same classes. They entered Gibson College as classmates and finished together. They were converted and dedicated their lives at the same church meeting in the Methodist Episcopal Church South. Reverend Umsted was licensed to preach on September 12, 1868, by Dr. G.W.D. Harris and M.M. Taylor. He and his wife, Sarah Virginia "Jennie" Graves Umsted lived on a farm in Gibson County until they moved to Arkansas in November of 1869. They settled in Searcy, White County, Arkansas, where he was a local preacher. In 1873 Reverend Umsted joined the White River Conference, and in 1874 was assigned to the Jacksonport Circuit in Jackson County, Arkansas. The parsonage home was in the community of Elgin. Those were pioneer days, and Reverend and Mrs. Umsted met the difficulties as real heroes. In an undesirable little house, amid mud, water, and jungle, and while people were shooting and killing bear within a few hundred yards of the building, on December 24, 1874, he organized the Methodist Church in Newport, Arkansas, with 6 members. They were Reverend Umsted, Samuel Rohrer, Achilles W. Horton and wife, Jennie, Mrs. Laura Dills, Mrs. Lydia Steen, and one or two others. While he was preaching and organizing the church, Mrs. Umsted was on her knees, praying in the little parsonage home. Truly, she was the Spiritual mother of Methodism in Newport. And, as this was the first church organized in Newport, she was the mother of all faiths in Newport. The churches here have built on their sacrifice, prayers, and labor, which were unceasing. Jacksonport Circuit at that time included churches from Walnut Ridge to Augusta. The Methodist Circuit rider traveled by horse through all kinds of weather. Rev. Umsted often had to get off his horse and walk to keep from freezing. They spent 50 years of active service in the Conference. In 1920, after their active ministry was over, they were again living in Newport, and he decided to organize a new church. This was to be Umsted Memorial Church in East Newport. Later, a home was built across the street from the little church. This house was a gift from the people of Newport, and was to be their home as long as they lived, regardless of who served as pastor. At their deaths, it was to go to the Umsted Memorial Church as a parsonage. Mrs. Umsted died in 1925 and the beloved pastor in 1932. 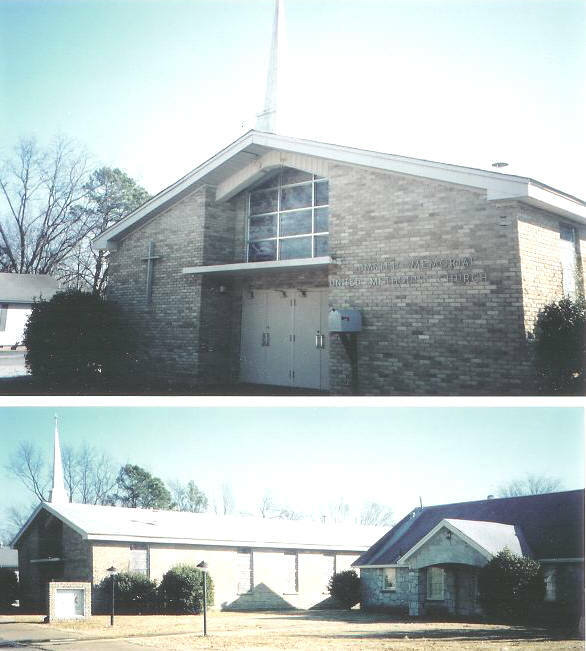 It is well that the Umsted Memorial Church was dedicated to them by the Methodists of Jackson County, Arkansas. The above information was compiled by Betty Umsted Young from various old pieces of church literature. Milton Brown Umsted was born December 22, 1847 in Gibson Co, Tennessee, and died May 24, 1932. He married Sarah Virginia Graves November 21, 1866. She was born February 17, 1848 and died March 13, 1925. Both are buried at Walnut Grove Cemetery, Newport, Jackson Co, Arkansas. From left to right: Leland Boswell, grandson of Milton Brown, son of Milton Arthur; unidentified young man; Milton Arthur Umsted, son of Milton Brown; three sons of Milton Brown, order uncertain (George Boswell Umsted, Thomas Porter Umsted, and John Talton Umsted); F W Hargraves; Reverend Milton Brown Umsted, Sarah Virginia Graves Umsted; Mrs Hargraves; Mary P "Mollie" Umsted, sister of Milton Brown; Annie D Umsted, daughter of Milton Brown; Mamie E "Mae" Umsted, daughter of Milton Brown; Mary Ellen "Mamie" Barker Umsted, wife of Thomas Porter Umsted; Flossie Mary Cook Umsted, wife of Milton Arthur Umsted. The children in front are Milton Arthur Umstead, Jr and Virginia Elizabeth Umsted, son and daughter of Milton Arthur Umsted. The Hargraves were very good friends and served as attendants at the anniversary. Also in attendance and unidentified were: Roy, Virgil, and Elbert Umsted, sons of Thomas Porter Umsted; Burrell Umsted, son of George Boswell Umsted; and John Talton Umsted, Jr, Lora Umsted and Leone Umsted, all children of John Talton Umsted. If anyone has additional identifying information on the people in this photo, please let us know.